But coffee isn’t just a breakfast drink anymore. It has become a drink-all-day beverage that comes in dozens of forms and flavors, most will be foreign to the first coffee drinkers. When you drink a cup of hot coffee in the morning, you’re brain and body responds to it on many different levels. For one thing, your senses are stimulated by the rich, creamy aroma of coffee as you bring the cup near your mouth. You will wake up from your stupor, savor the delicious aroma, and anticipate the joys that will come next. For another thing, your body gets a jolt of energy from the caffeine in the coffee. In fact, an average 7-ounce cup of coffee contains 80 to 130 milligrams of caffeine, a sufficient dose that will stimulate your body. If you drink three cups of coffee a day, at least, then you will have between 240 and 390 milligrams of caffeine in your veins. The effect of coffee on your mind and body can also be felt almost immediately. Within the first few sips, you can go from sleepy to perky, as well as be ready to take on the day’s challenges. No wonder then that coffee is part of your breakfast routine, as is the case for millions of people worldwide. 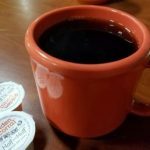 Most types of restaurants, from buffets like Golden Corral to fast-foods like McDonald’s, offer hot and cold coffee in their menus for this reason. “Let’s go for coffee.” Let’s take a coffee break.” These are oft-repeated invitations among friends, colleagues and acquaintances, thus, a proof that coffee can bring people together, literally and figuratively. Coffee can be taken either hot or cold when it’s consumed in the mid-day, afternoon, and even at night as a nightcap. In offices, the coffee break usually means a cup of hot coffee while among students, it’s more likely to be glass of cold, iced coffee in a wide range of flavors. With coffee being available in several forms and flavors, there’s at least one that will suit even the most discriminating taste. Lattes, cappuccinos, espressos, and frappes are just a few of the choices.